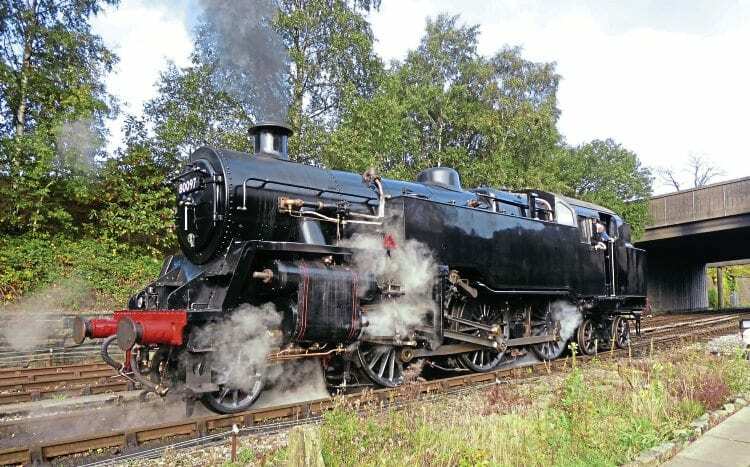 OCTOBER 18, 2018 will be long remembered by volunteers of the Bury Standard 4 Group as the date when they finally saw the fruits of their 33-year project to restore BR ‘4MT’ 2-6-4T No. 80097 at the East Lancashire Railway. Restoration of the 1954-built loco got underway following its acquisition from Woodham Bros scrapyard at Barry in 1985, and has continued ever since – mostly at weekends. The small band of volunteers has not only had to undo 20 years’ worth of damage from standing in the sea air at Barry, but replace many missing components and raise in excess of £100,000 to have the boiler completely rebuilt. This was completed in the autumn of 2017, and included the manufacture and fitting of a replacement boiler barrel, a new lower throat plate section, new three-quarter outer firebox sides, and extensive copper welding to the firebox tubeplate.